These cookies are a recipe I developed myself from two recipes: this one for flourless peanut butter chocolate chip cookies, and one from my friend Kate for “peanut butter blossoms” that we made at her flat in Ukraine back in December 2011 (!). 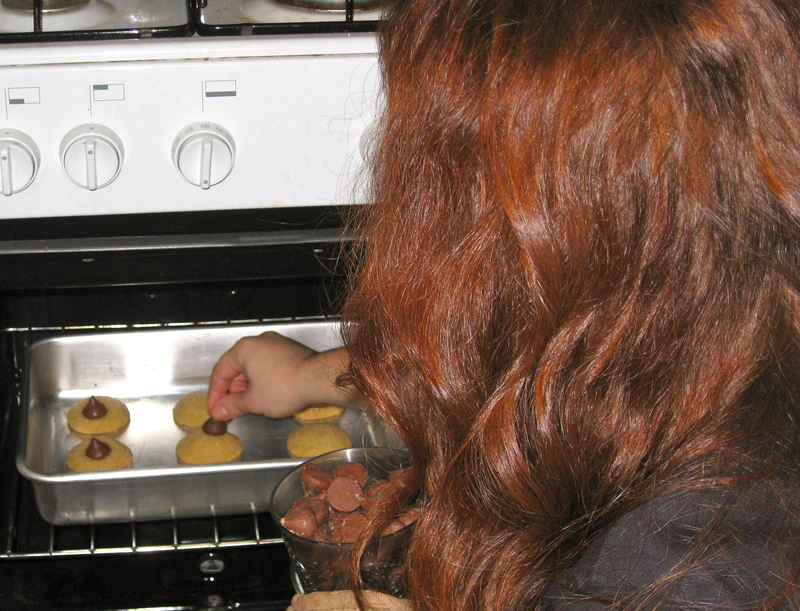 Kate, peanut butter blossom expert (Dec 2011, Sokyriany, Ukraine). These cookies were amazing and inspired my recipe. After looking at the two recipes, I came up with my own variation. My cookies are not flourless, but they do have oats and less sugar than Kate’s recipe used. I didn’t have Hershey’s Kisses on hand, so I used pieces of rich dark chocolate. I added some vanilla and a dash of cinnamon. 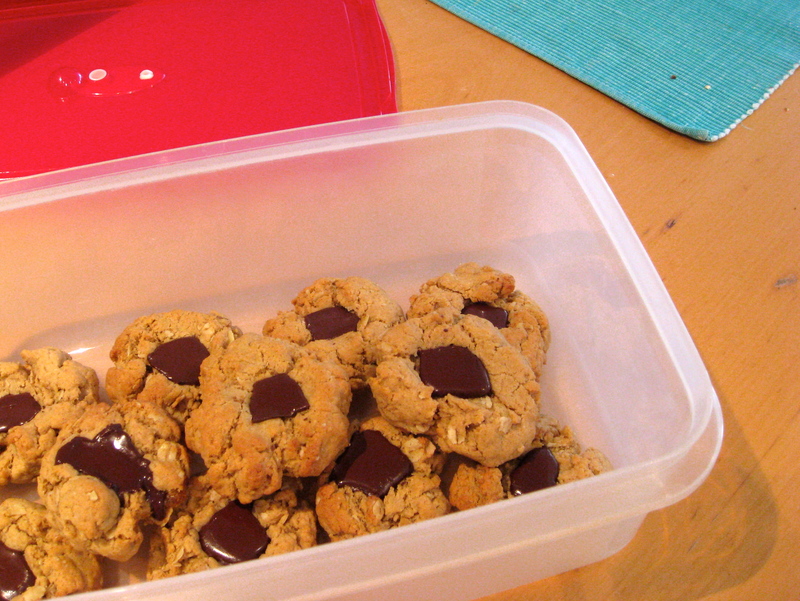 The cookies turned out great: delightfully chewy but with a nice texture from the oats and a big kick from the chocolate. I had to restrain myself from eating more than a few four in one sitting, and they were a hit with my boyfriend and CELTA classmates. Preheat the oven to 360F (180C). Combine the wet ingredients (through vanilla) in one bowl. In a separate bowl, whisk together the dry ingredients and then add them to the wet ones, stirring until combined into a nice dough. Form small balls (just use your hands, it’s the easiest way) of dough and place them on a cookie sheet, pressing gently into the center of each with your thumb. 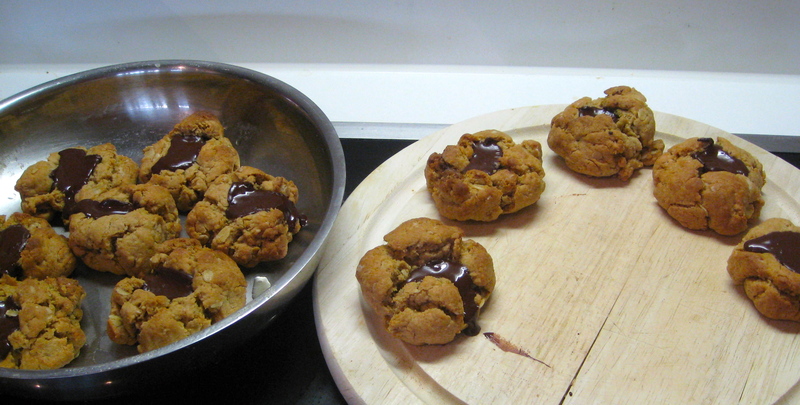 Bake for 6-8 minutes, then press a chocolate piece into the top of each cookie. Return to the oven for an additional 2-3 minutes, then remove and let cool. Repeat for however much dough you have. What’s your favorite way to make peanut butter cookies? This entry was posted in celebrations/holidays, community, food, pictures, recipes, travel on 09.02.2013 by taplatt. Thank you! They turned out well and you can easily adjust ingredient amounts up/down to your liking.